Ukrainian champion and Turkish Airlines Euroleague hopeful BC Donetsk signed one of the greatest shot-blockers in European history, D'or Fischer, over the weekend. Fischer (2.11 meters, 30 years old) is the competition's career leader in blocks per game (1.49 bpg.) and is sixth all-time with 112 rejections. By joining Donetsk, he reunites with former teammate Doron Perkins for the fourth time with as many different clubs in as many different countries. Fischer has played in the Euroleague for each of the past four seasons. Last season he averaged 7.9 points, 5.9 rebounds and 1.1 blocks in 19 games for Gescrap BB, which he helped reach the Euroleague playoffs in the club’s maiden season in Europe’s premier competition. 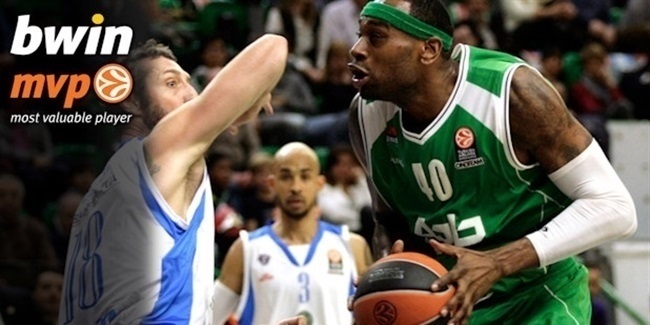 He further produced 8.5 points, 5.5 rebounds and 1.9 blocks in the Spanish League. The previous season he helped Real Madrid reach the Euroleague Final Four. Fischer has also played for Euphony Bree, where he was named the 2007-08 Belgian League MVP after leading the league in rebounds, blocked shots and index ranking; EWE Baskets Oldenburg, with whom he led the German League in blocked shots in the 2006-07 season; Anwil Wloclawek in Poland; and Maccabi Tel Aviv, with whom he made his Euroleague debut in 2008 and won one Israeli League crown and one Israeli Cup in two seasons. Fischer previously teamed with Perkins at Bree, Oldenburg and Tel Aviv.